LP cedar shake siding is the perfect choice for homeowners who want to achieve the classic look of wooden shake siding, but don’t want to deal with the constant upkeep required to maintain wooden siding. LP’s engineered cedar shake wooden siding offers the attractive, eye catching appearance of real cedar, with the advanced durability that comes with LP’s SmartGuard® finishing process. 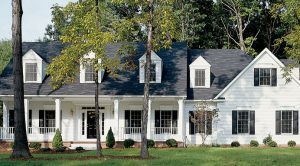 Cedar shake siding can be used to cover a whole home, but it is also suitable as a decorative accent to lap or panel siding. When you turn to Krech Exteriors for new siding in Minneapolis or St. Paul, our experienced design team will work with you to choose the best fit for your home. We’ll help you find the right combination of siding or styles or to choose the one style that will make your home stand out in your neighborhood. FREE Estimate on LP Siding for Minneapolis Homeowners! Krech Exteriors is your leading certified source for top quality LP siding in St. Paul and Minneapolis. Give us a call at (651) 688-6368 and set up your FREE in-home consultation with our local LP siding experts!